After uncovering the secrets of Midnight Manor, Delaware St. John and partner Kelly Bradford find themselves involved in a new mystery that proves to be darker and more sinister than the manor. Deep in the woods of northern Maine, there lies a town. A town that has never been recorded on any map. 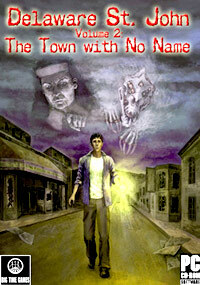 For twenty years, the town has stood vacant after all its occupants vanished one fateful night. The voices have called to Delaware and as he explores the Town with No Name he comes to realize that the most important secret he’s about to uncover is his own. • VIC (Voice/Imagery Communicator) – A modern PDA device for communicating with his assistant, Kelly. Delaware will use it to take pictures, record sounds and contact Kelly for clues. • Mystery – The voices have called Delaware to the site of a long-abandoned town. The secrets here are going to change Delaware forever. • Interrogate – The spirits that remain here have the answers you’re looking for. Ask the right questions to find out vital information. • Survive – There’s something evil roaming these dark streets. Delaware must be quick and resourceful if he’s to escape. • Psychic Lead – Delaware has been receiving strong visions that will lead him closer to uncovering the evil that resulted in the loss of an entire town overnight.